SENTINEL BIRTHDAY BASHES ARE THE BEST! GETS A COOL SENTINEL MARTIAL ARTS T-SHIRT! HELPS OUR INSTRUCTOR LEAD THE LESSON! BREAKS A REAL BOARD IN FRONT OF THEIR FRIENDS! CUTS THEIR BIRTHDAY CAKE WITH A REAL SWORD! GET 1.5 HOURS OF FUN AND EXCITEMENT, AND "HERO" STATUS FOR THEIR BIRTHDAY CHILD. 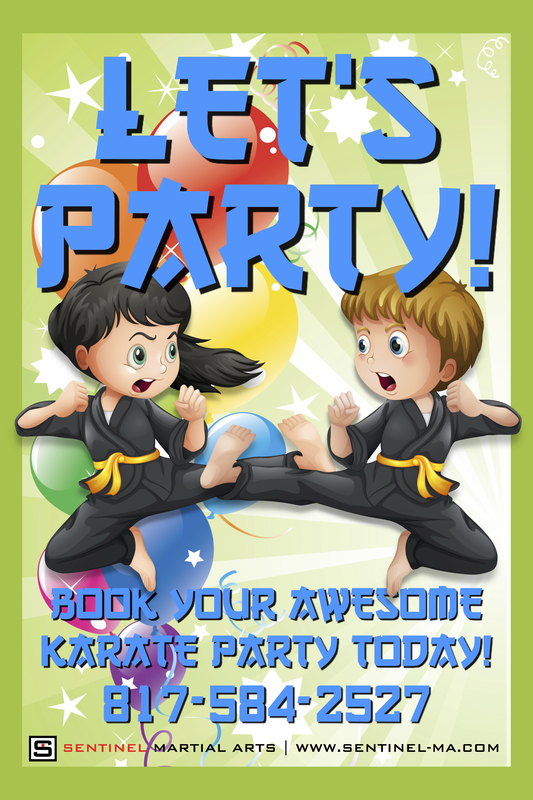 Your child's friends will have a blast, and your birthday child will be the "hero" at the center of the action as they (with the help of our great martial arts instructors) get to lead all the fun in their karate lesson, break a board in front of everyone, and cut their cake with a real sword! CAN GET IN ON THE ACTION IF THEY WANT. Parents can sit back and watch the fun and action, or they can participate in all the activities themselves! CAN HAVE UP TO 20 OF YOUR CHILD’S FRIENDS AT THE PARTY. Most party packages include just 10 friends and require you to pay a lot more for each additional. Our packages include MORE THAN DOUBLE THE FRIENDS for one low rate! CAN EXPECT YOUR CHILD AND THEIR FRIENDS TO TALK ABOUT THEIR PARTY FOR WEEKS AFTER! Our birthday parties are UNIQUE and CUSTOMIZED - you choose the theme, we do the rest. Our parties are so fun and so different from the typical trampoline park or Chuck E. Cheese party that kids still talk about them weeks, months and even years later! GET A TOTALLY UNIQUE, CUSTOM PARTY THAT WILL NEVER BE DUPLICATED AGAIN! We plan each party according to your wishes, and customize all the games and activities to your child's favorite superhero, character or theme - so give us a call now and we'll work together to make your child's birthday party dreams come true! Kids decorate their own solid pine board, then get to break it with a super-cool martial arts technique they learn at the party! Black Belts put on a rockin' demonstration with your choice of sword, spear, nunchaku, bo staff, kamas, tonfas, escrima sticks, knife, sais or a combination! Afterwards, kids get a chance to ask questions and check out the weapons. Kids spar in full protective gear using our safe and fun padded weapons (sword, nunchaku, bo staff or escrima sticks) under the supervision of our professional instructors! Kids learn ninja techniques with their own padded nunchaku that they get to take home with them after the party! How do I get my digital birthday party invitations? Click here to download your invitations. What kind of characters or themes can I do for my party? It's your party - you can choose anything you want! It doesn't even have to be related to martial arts. Popular parties include superhero (Spiderman, Black Panther, etc. ), warrior princess, ninja, samurai, pirate, ninjago and Teenage Mutant Ninja Turtles. We've also done a spy party, an under-the-sea party, a dinosaur party, and much more. We've even done parties with no particular theme besides "birthday fun", and they're just as awesome as all the rest! Can I bring in food and drinks for the party? Yes, you can bring in any food and drinks you like for the party. Can I have more than 20 guests at the party? Yes. Although 20 is our recommended number of children for the best party, you can have up to 10 additional guests (+$10 each/basic bash, +$15 each wild about weapons or pizza party). Can parents or other adults stay at the party? Yes, parents and other adults are welcome to stay and even join in the activities if they like. Do you provide tables and chairs? Yes, included in your birthday package, we can provide up to four six-foot-long tables and seating for 30+. Keep in mind, though, that the more tables we set up, the less mat space will be available for the kids' games and activities. We generally recommend either (1) our typical setup of chairs and loveseats surrounding the activity area, or (2) a 3-table/20-chair setup with extra guest seating. See diagrams here. Can I put up my own decorations for the party? Yes, we allow 30 minutes prior to your scheduled party time to put up decorations, and will be happy to assist you. Do you provide the cake for the party? We would be happy to arrange for your cake at the party. We don't include this in our packages because, in our experience, people prefer to provide their own special birthday cakes. Please call us if you would like to arrange for this option - charge is just the cost + service fee. Do you host other types of parties? Yes, we can host many other types of parties including sports team celebrations, movie parties, gaming parties, sleepovers, graduation parties, baby showers, and more. Call for rates. Do guests need to sign a waiver? Yes, you can sign a waiver online here or print out a copy here, fill it out, sign and bring it to the party. If you have any other questions, please contact us. We are always happy to help with planning your special occasion celebrations! Call or text Hope Song at (817) 584-2527.